Please check if there is damage caused by transportation. if yes,please control supplier for repalcement. Please follow the specification instruction and notice to keep products in a good and safe use condition. Put the socket in proper condition and out of reach of the children. Plug in fully to the socket while using. The total power of being electric connected appliances could not be bigger than the maximum power of the socket. Do not disassemble or install the socket,otherwise there may cause security risks. 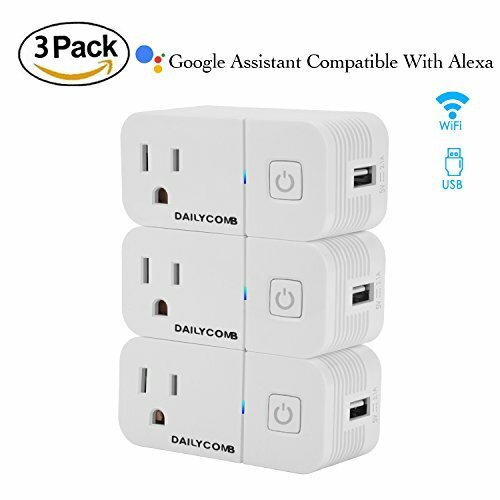 Dailycomb Smart plug Compatible on Alexa Echo Dot, no hub inquiry, no monthly fees, simple to setup and reliable on your stable wi-fi connection. additional Dailycomb smart plug in another device to work together. free smart life app, you can turn your devices on and off and set no worry schedules from anywhere in the world. When you use 'Away Mode,' Smart plug will turn plugged-in lights on and off randomly to create the illusion that you're home even when you're out. - Radio protocol: Support 2.4GHz network, not support 5.0GHz.